The waterfront home lifestyle maximizes enjoyment of the finer things in life. Until you have lived directly on the water with your speed boat floating in the dock just outside and sipped your favorite beverage as the sun sets over the lake you may not fully appreciate the true wonder of it all. Fit for residents and tourists alike, waterfront homes in the Lake Havasu area offer unparalleled access to the Colorado River and boating, and the amazing lifestyle. It’s no surprise that the Lake Havasu waterfront real estate market is always bustling with buyers and renters all year round however other than condos in the channel most waterfront property in the area is located in either Parker, AZ 30 minutes south of Lake Havasu just below Parker Dam or in Mohave Valley and Bullhead City, 45 minutes to an hour north. Keep in mind however the entire resort town of Lake Havasu City overlooks the lake and therefore no matter where you buy your home the water is always close and the Lake Havasu Marina offers daily and monthly slips to store your boat in the water at all times. Unlike the many superb homes found in other areas of Lake Havasu, Lake Havasu waterfront condos are available and perfect for those wanting to acquire true Lake Havasu Waterfront Real Estate without having to go to Parker or Bullhead City. When you aren’t in need of all the space (and the maintenance that comes with owning a house), enjoy a low-key lifestyle that is rooted in recreation and enjoyment, and be pampered with in-community amenities such as fitness rooms, tennis courts, association beaches and more. Kingsview Condos, The Isles, and Isleside are all on the water near the London Bridge and are excellent choices for a Lake Havasu waterfront condo. If indeed you desire a true waterfront home in the Lake Havasu area then Parker, Arizona needs to be considered. 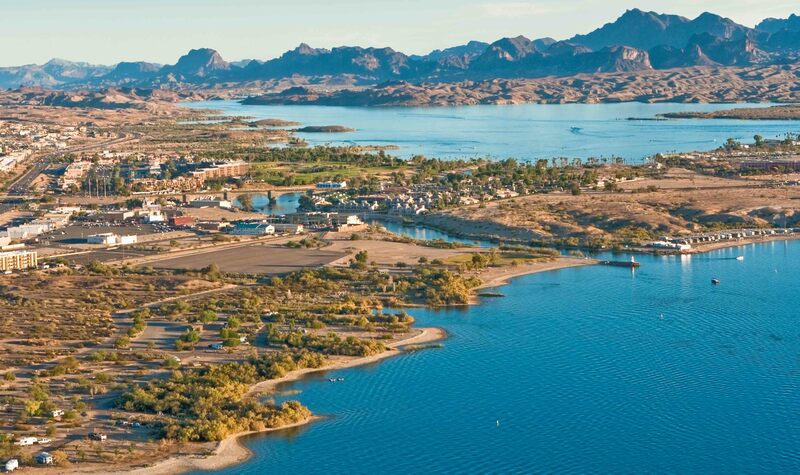 From palatial estates in Miraleste Shores, to beautiful channel homes in Moovalya Keys with boat docks and access to the river, to an eclectic mix of homes and manufactured homes in Marina Manor…Parker, Arizona has many outstanding Lake Havasu Waterfront Real Estate options. Parker is just south of Lake Havasu City and offers a unique and fun resort market feel with floating bars and restaurants on the river as well as the beautiful Bluewater Casino Resort and Marina. Desert Bar (literally a bar in the middle of the desert) opens during the winter and offers live music, western flair, and is a hit with both off-roaders and winter visitors a like. Wherever you go, you will always have access to the many recreation options both on the lake and on the river as well as being a part of an exciting area that has everything you need, from terrific shopping and dining, an active nightlife, and great boating, golf courses, and off-roading. Bobby and Julie Lewis are your Lake Havasu waterfront real estate specialists. With many years of experience and as fellow residents of Lake Havasu, rely on their knowledge and skill to make your Lake Havasu home search in this area a success.